Sir Frederick White was one of the most influential men in Australian science during and after the Second World War. At the comparatively early age of 39, he resigned from his chair of physics at Canterbury College, University of New Zealand, to become an Executive Officer of the Council for Scientific and Industrial Research (CSIR) in Australia. Many years later he was to write In doing so I abandoned any future personal activity in scientific research. I have never regretted doing so. Frederick William George White was born on 26 May 1905 at Johnsonville, a suburb of Wellington, New Zealand. His mother Wilhelmina (Mina), had gone there to be with her sister because her husband, a seaman, was often away from their home in Wellington with the Union Steamship Company of New Zealand. His father William and uncle Horace had both gone to sea when aged 18 and both were to become chief stewards. Some of their voyages brought them to New Zealand where they later settled, William in Wellington and Horace in Auckland. Fred’s mother’s elder sister Mary and her husband Finlay Bethune were a gifted couple with no children. They took a great interest in Fred and had considerable influence on him. The Whites moved from Wellington to Dunedin when Fred was five. However, his attendance at the local school was shortened by a serious illness and his schooling did not begin properly until he was nine. This was to be a serious handicap later, when he was too old to qualify for some government bursaries. During the 1914-18 war, his parents moved back to Wellington, where his father was transferred to the overnight Wellington-Lyttleton ferry. Fred attended the local Te Aro government school. It was then that the rather shy lad, who avoided games as much as possible, was found to have such bad eyesight that he sometimes walked into posts in the street! He wore spectacles for the rest of his life. In 1920, Fred entered Wellington College, a private school, and his parents had difficulty finding the fees needed until his secondary education was completed in 1925. He did not regard himself as a noteworthy academic scholar. Science was clearly to his liking, due largely to the senior science master, an enthusiastic man from Cambridge with a deep interest in astronomy. With another student, Fred helped to look after the science laboratory and the small college observatory. During this period he was to find his real interest in the school’s Wireless Club. He built a transmitting and receiving system for his home and communicated in morse code with New Zealand amateurs and occasionally with others in the USA and England. He had little idea of what he wanted to do after school, though he was vaguely attracted to engineering. Fortunately, his parents, especially his mother, thought it important that he qualify for university entrance. Fred joined the Wellington Tramways as an apprentice in their tool room, while doing a part-time University course in science as required for engineering courses, then conducted in Christchurch. In 1925, when his parents were able to find the funds, he enrolled in a full-time science course at Victoria College, studying physics, mathematics, chemistry and one year of geology. He quickly became absorbed in physics under Professor DCH Florance, who had been with Sir Ernest Rutherford in Manchester in 1914. Fred found physics easy, with the result that he was always top of the class of about twenty. Fred graduated with a BSc in 1928 and was Senior Scholar for New Zealand in physics. Scholarships and a job as a physics demonstrator enabled him to study for his Master’s degree. In his thesis, he investigated the vibration modes of quartz crystals and developed a standard frequency meter. He graduated with First-Class Honours MSc in 1929 and, after Prof Florance wrote to Rutherford, was accepted as a postgraduate student in the Cavendish Laboratory and as a member of St John’s College, Cambridge University. At St John’s College, White’s tutor was the former Antarctic explorer, the geologist James Wordie. It was an exciting time for White to be joining the Cavendish. Its director, Rutherford, had continued the traditions of his predecessor, JJ Thomson, who was still to be seen there most days. Experimental research into the structure of the atom was soon to culminate in a sequence of momentous discoveries. White had come to work with JA Ratcliffe, distinguished for his research on wireless wave propagation. An understanding of wireless wave propagation was of fundamental importance in geophysics and of great practical significance for wireless communications. Ratcliffe asked White to investigate a curious anomaly in the ground-wave propagation from a long-wave transmitter at Daventry, reported by Ratcliffe and Barnett in 1926, and at a much shorter wavelength by Ratcliffe and Shaw in 1929. Near the transmitting aerial the signal amplitude, after allowing for the inverse law, increased with distance. This represented ‘negative attenuation’ by ground losses, as predicted by Sommerfeld’s theory for certain values of the electrical parameters of the soil. In the Cavendish ‘string and sealing wax’ tradition, White built a field-strength receiver, an exacting task in those days. He also made laboratory apparatus to measure the parameters of soil samples, for comparison with theory, and confirmed that they were very frequency-dependent. With the new receiver, White found no evidence of negative attenuation and showed that the apparent anomaly had been due to a non-linearity in the original receiver used for the long and short wave measurements. During 1931, White became interested in the amplitude of ionospheric reflections. His studies, however, were interrupted late in 1931 when his scholarship ended. Rutherford suggested that he apply for a teaching post at King’s College London, where Appleton was the Wheatstone Professor of Physics. He was appointed Demonstrator in Physics and Assistant Lecturer in 1932 and was able to resume work for his PhD. White’s research included a study of diurnal variations in the amplitude of ionospheric reflections to establish the relative importance of losses by absorption and transmission through the layers and a study of the propagation of high-frequency currents on a length of radiating wire, an important problem in the electromagnetic theory of aerials at that time. The completion, during 1933, of White’s research on diurnal variations of the ionosphere marked the end of his thesis work. The year 1934 was auspicious for White, with his PhD (Cantab) degree conferred and his monograph, Electromagnetic Waves, published in the Methuen series. This little book, based on his lectures on electromagnetic theory to advanced students, was so popular that it ran to four editions, the last in 1950. A paper on the automatic registration of ionospheric reflections was also published in 1934. The pulsed system provided records of the first and second reflections and the equivalent height. Observations of reflection coefficients with this equipment, carried out with a postgraduate student, continued until the end of 1935. During 1936, he successfully applied for the chair of physics at Canterbury University College, Christchurch, New Zealand, arriving in February, 1937. The Whites had no difficulty in settling into the social life of Canterbury College and made many friends including a very keen young philosopher from Vienna, Karl Popper, who had joined the staff of the Philosophy Department. White started at once to organise ionospheric research in his department. He studied the behaviour of the ionosphere using data on aurorae, radio fadeouts and magnetic storms published by the Magnetic Observatory in Christchurch. For an ionospheric observatory in New Zealand, its position relative to the Antarctic zone of maximum auroral frequency was of considerable interest. White assembled observations of Aurora Australis logged by early navigators to the Antarctic, beginning with Cook in 1773. Combining these with data from the auroral reports of British, American and Australian expeditions that had wintered on the continent after 1901, White was able to establish the first reasonably accurate position for the zone. He also made observations of the critical frequencies and maximum electron density of the F2 region and soon confirmed the anomalous diurnal and seasonal variations of the F2-region ionisation, previously noted in northern-hemisphere studies. Measurements were also made at a series of fixed frequencies of the total absorption of waves reflected from the F-region during the southern winter (1938) and summer (1938-39). During 1939, White published a theoretical paper on the dispersion of radio echoes from the ionosphere, which established that the dispersion produced no difficulties in interpreting experimental results. In the same year, he showed that the communication conditions over an ionospheric circuit could be predicted and set out the principles to be followed. Such prediction techniques were to become very important to the Armed Services in the impending war. In the same year, the automatic ionospheric recorder was installed at Christchurch, but by then White had become involved in more urgent work. Early that year Britain decided to inform Australia and New Zealand about its secret radar work and DF Martyn and Ernest Marsden, (Secretary of the Department of Scientific and Industrial Research, DSIR), were sent to England for this purpose. On his way back to Australia in August, Martyn spent a short time in New Zealand and suggested that White should join the urgent radar program to be set up in Sydney. In January 1941, the Australian government, acting on the advice of Professor JPV Madsen, of the Australian Radio Research Board (RRB), requested the New Zealand government to lend White’s services for three months in connection with the development of radar. For this work CSIR had set up the Radiophysics Laboratory in August 1939 within the grounds of the University of Sydney, with DF Martyn in charge. A Radiophysics Advisory Board (RAB) was also established to recommend research policies and priorities and to provide co-ordination and liaison with the Fighting Services. Chaired by Madsen, its members were: Sir David Rivett, Chief Executive Officer of CSIR; Daniel McVey, Director-General of Posts and Telegraphs; and the Chiefs of the three Defence Forces. He was soon grappling with deteriorating relations between the CSIR Radiophysics Laboratory, the PMG and the Services. Systems based on a complex new technology had to be developed rapidly to meet Service requirements and then integrated into a major production effort. Lack of experience with these problems and the pressures of wartime led to tensions between the parties and, unfortunately, Martyn’s personality often exacerbated rather than calmed the situation. As a result the very successful Shore Defence (ShD) gunnery radar suffered severe production delays. White sought to maintain the lines of communication with the PMG by meetings with McVey and with Witt, director of the PMG Research Laboratories. Gradually during 1941 he won their trust and was able to arrange temporary staff exchanges. With the Services, White achieved the establishment of a system of agreed priorities to end the wasteful inter-Service rivalry. Dismayed at the lack of knowledge and understanding of radar and its potential in the upper ranks of the Services, he persuaded the Army to appoint two radar liaison officers to CSIR Radiophysics Laboratory. In mid-1941, he convened a conference of Professors of Physics with the aim of enlisting science undergraduates and giving them a concentrated course on electromagnetic waves and radar electronics. A school, vigorously developed by Professor VA Bailey at the University of Sydney, started in September 1941. By 1943, the school had trained some 150 RAAF officers, who commanded the stations of the vital air-warning system. In these and other problems, White made the time to deal with the day-to-day detail himself. This brought to the RAB a much-needed element of continuity and his apparently imperturbable temperament was a steadying influence. In September 1941, the CSIR Executive accepted a plan by White to divide the work CSIR Radiophysics into three sections. Martyn was made responsible for research on long-wave radar. The development of microwave radar was entrusted to JL Pawsey, who had been in the USA for several months to study the latest work. White himself, as Acting Chairman of the Board, took on full responsibility for the Laboratory, including liaison on production. White now intensified his efforts to deal with the obstacles hindering production. He proposed a much closer association with the Ministry of Munitions and Supply and the fullest possible use of the design and production facilities of the New South Wales Railways. As a result, a special annex was set up at the Eveleigh Railway Workshops, Redfern, not far from the Radiophysics Laboratory, to manufacture large aerial array structures and rotary mountings, designed under the direction of JG Worledge in the Electrical Engineering section of the Railways. This became one of the most successful production teams in the Australian radar program. In August 1941, White had become concerned that the development of air warning (AW) radar systems had low priority in Australian defence strategy. In October the Services’ Joint Policy Committee (JPC) accepted the need for AW stations to supplement the ShD defences against ships and identified 32 locations, with Darwin as top priority. Although the JPC recommendations were not approved until November 1941, White had anticipated the outcome and had started development of AW in September, but the work was slowed by manpower shortages. White’s prescient AW initiatives had prepared the way for a rapid response to a dramatically increased threat to Australia, following the Japanese air attack at Pearl Harbour on 7 December 1941. An Australian AW set, based on converting the ShD system to one optimised for air warning, was designed and tested by a team led by JH Piddington and installed at Dover Heights, Sydney, by 12 December. Manned by Army personnel and maintained twenty-four hours a day by RPL staff, this improvised model provided the only radar air warning for the Sydney area over the next six months. Six sets were ordered by the RAAF, including one for Darwin. These were manufactured jointly by the Radiophysics Laboratory and the Gramophone company (HMV). Stringent secrecy had at last been sacrificed for speed of production. The year 1942 was to be the most traumatic in the Board’s history. Under the looming threat to Australia as the Pacific war rapidly drew nearer, the Curtin government, elected three months earlier, had to take whatever actions were necessary to achieve full industrial mobilisation. Madsen, as Chairman, had to face a searching cross-examination on radar production by the War Cabinet on 26 January. It was clear that still more was expected of the Board. On 19 February 1942, Japan launched a massive and devastating attack on Darwin by carrier-borne aircraft. In spite of White’s repeated urging during the previous six months, Darwin was still without an operating air-warning radar and there were heavy losses of life, shipping and installations. The government at once set up a Commission of Inquiry. Some people in the RAAF, earlier sceptical about the new weapon, now blamed the Radiophysics Laboratory for the lack of radar warning. The Inquiry’s report found otherwise. All three AW radars initially ordered from CSIR had been delivered to the RAAF by 4 February. The equipment for the Darwin station was flown in several loads, the first arriving on 9 February, together with the radar mechanics. But over-confident of its ability to instal and adjust the system in the field, the RAAF had declined assistance from CSIR Radiophysics. When help was eventually sought from CSIR in mid-March 1942, JH Piddington, BFC Cooper and the RAAF crew had the system operational by 22 March. An incoming enemy raid was immediately detected, intercepted and dispersed. One bomber was shot down. The high performance of Australian radars helped eventually to bring Japanese raids on Darwin to an end. The AW radar, further developed as a light-weight air-transportable system, became Australia’s most enduring radar achievement and was widely used by Australian and US Forces for the rest of the war. The number of radar types under development in Radiophysics Laboratory grew steadily through the latter part of 1942 and during 1943. White formed a Radar Counter Measures (RCM) group to develop equipment for detecting and jamming enemy radar and to devise means for countering similar enemy action. At the end of June 1943, White left to visit radar centres in the USA and UK. At the MIT Radiation Laboratory he was delighted to meet Taffy Bowen again. As one of Britain’s leading radar experts, Bowen had been a prominent member of Sir Henry Tizard’s mission to the USA in 1940. White persuaded him to join him at Radiophysics on secondment. Bowen arrived in Sydney in January 1944 to take up his appointment as Deputy Chief (Research). White now had two very experienced deputies. His Technical Committee, with its more frequent meetings, gradually assumed many of the functions of the RAB which, after early 1944, met only twice before the end of the war. In that period, radar development in CSIR centred mainly on the needs of the RAAF. A high-power 25 cm magnetron, designed and produced in Australia, formed the basis of a new and sophisticated long-range air-warning system, which provided height information and good coverage against low-flying aircraft. It was perhaps the outstanding technical achievement of the Laboratory, but came too late in the war for production. After the war, the US government wished to honour White with the Medal of Freedom for his contributions to the American war effort, but this was vetoed by the Australian Labor Government, because of its policy of not bestowing honours on civilians. Ironically, Bowen, a British subject, was able to accept the Medal. By then, however, White’s wartime reputation for strong leadership and skilful management had been recognised in another way. As early as 1943, the CSIR had begun to consider research programs and policies needed for Australia in the post-war world. At the end of 1944, White was invited to join the Executive Committee in Melbourne and participate in this task as an Assistant Executive Officer, with special responsibility for the physical sciences. The members of the EC were the part-time Chairman, Sir George Julius, the CEO, Sir David Rivett FRS (both foundation members) and Professor AEV Richardson. The Science and Industry Research Act authorised CSIR to conduct researches beneficial to primary and secondary industry. In the early years CSIR’s research was devoted almost entirely to rural industry, but by 1936 there were economic and political reasons for development of the nation’s industrial capacity and with it the need for supporting research. The CSIR professional staff had increased during the war by a factor of three to about 600, more than half of whom were engaged in research for secondary industries. Planning for peacetime research was a major task and the appointment of White to the Executive Committee at this time was particularly opportune. the formation of a Coal Survey Section initially to study the chemical and physical properties of all Australian coal deposits; later during the 1950s, research was extended into coal preparation, coal processing and the use of by-products and in 1960 became the Division of Coal Research. During 1945, White crystallised his ideas on the best ways of organising new research to produce maximum practical benefits in the long-term. He noted that the Executive Committee in its early years had spent much time identifying problems that needed attention. Often planning had failed at this point because suitable scientists were not available. White was clearly in favour, where possible, of a second method in which a first-class scientist is appointed to undertake fundamental research in an area likely to lead to applications of great originality. This is, if successful, the most profitable. It is at the same time an approach most difficult to sell to governments, for no promises can be made in its early stages. The great growth of CSIR during the war and its expansion into industry-orientated and defence research all indicated the need for a more basic examination of the management structure. Any orderly and comprehensive consideration, however, was overtaken by the dramatic and turbulent events of 1948-49, in which White was to become deeply involved. Rivett believed passionately in the classical ethos of science: freedom to search for and exchange fundamental knowledge, from which technological progress followed. He believed that any secrecy would poison the spirit of science and that defence projects should be kept clear of CSIR and the universities. White and his colleagues on the Executive Committee were in agreement. The problem was that pockets of secret work still remained in CSIR, the major one being the Division of Aeronautics which, involved in defence projects, needed close collaboration with its British counterparts. An external review of CSIR’s management structure conducted by HC Coombs, Director-General of Post-War Reconstruction, and W Dunk, Chairman of the Public Service Board (1948), endorsed the principle of separating defence and civil research and advised against the transfer of the whole of CSIR into the departmental system. The report proposed that the Executive Committee should become the governing body, with the Council reduced to an advisory role. The Government accepted the Coombs-Dunk proposals and, under strong Opposition pressure, became anxious to have the bill passed before Parliament rose at the end of March 1949. However, the detailed drafting of a new Bill for the reorganised CSIR, to be called the Commonwealth Scientific and Industrial Research Organisation (CSIRO), required much work and care. White was determined to take an active part in the drafting process and spent a hectic two weeks with the parliamentary draftsman. He was anxious to ensure that only essential changes were made to CSIR arrangements existing under the old Act. In the end, he was satisfied that he had achieved all that was possible. 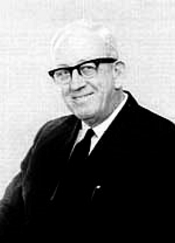 Rivett, disillusioned by the Government’s changes to CSIR, retired when the new Act was proclaimed in May 1949, though he continued with the Advisory Council until 1958. Richardson retired at the same time. Some in CSIRO felt that the institution had suffered a major setback with the new legislation. White strongly disagreed and emphasised that the Executive now had responsibility for policy and management of the Organisation’s affairs. In my view the new CSIRO acquired an enhanced opportunity to fulfil its appointed purpose rather than the reverse. White’s program for wool textile research became one of CSIRO’s most important post-war activities. Early successes at Geelong included non-staining sheep-branding fluids and improved chemical processes for cleaning raw wool. In the longer term, fundamental studies of the physics and chemistry of wool fibres (see Wool fibre structure) contributed to improvements in wool processing and the properties of wool garments. Methods and machines developed for the objective measurement of wool revolutionised the classification and sale of wool. Major processing developments led to non-shrink, machine-washable, light-fast fabrics, capable of permanent creasing or pleating (see SiroSet). Faster and cheaper spinning methods (see Self-twisted yarn, Sirospun and Solospun®) and a continuous printing process also helped to maintain the position of wool in competition from synthetic fibres. the transfer of CSIRO headquarters from Melbourne to Canberra, approved by Cabinet in 1964-65. He retired from CSIRO in 1970. Though there had been extensive studies of the songs of birds in other countries, much less had been done in Australia and Fred became interested in the scientific study of the songs of the male Olive Whistler in the Kosciusko National Park in the Snowy Mountains. Over three Australian summers he made recordings of the ten principal song types in three areas. Using acoustic equipment in the Linguistics Department of the ANU to produce sonograms, he identified some of the song functions and traced the birds’ seasonal migrations. The breadth of his interests is shown further by his collaboration with the Australian Academy of the Humanities to protect aboriginal rock art, arising out of the work of his son, Peter, a Reader in Archaeology at the University of Sydney. As well as making a substantial donation to the Australian Academy of Science for the Frederick White Prize and the Elizabeth and Frederick White Conferences, he chaired the Joint Academies Committee for the Protection of Prehistoric Places. Sir Frederick White’s career in CSIR/CSIRO spanned 29 years. He had emerged in 1945 from his baptism of fire in wartime radar with a new-found talent and reputation as a leader of great scientific enterprises. He experienced and contributed to the spectacular CSIRO successes of the 1950s, when the public attitude to science was expectant and optimistic. He underpinned the foundations of the Clunies Ross ‘golden age’ and was in many ways the architect of the Organisation’s development. As Chairman of CSIRO, he became the dominant figure in Australian science, equally at home with the leaders of government and scientists at the bench. When changes in political and public perceptions of science emerged in the 1960s, he vigorously supported the scientific ethic and the autonomy and role of the CSIRO. The OECD examining team that visited Australia in 1974 (four years after White’s retirement) reported on CSIRO in favourable terms and recommended no major changes. White had a talent for selecting able people for scientific tasks and a genuine interest in their subsequent careers. He inspired loyalty and affection in his staff, who respected his straightforward unpretentious manner, strength of character and generosity of spirit. He was a constant source of encouragement and went to great lengths to ensure that worthy and successful scientists received due recognition. Even among those in the wider scientific community who disagreed with him on CSIRO policy, it was rare to find an enemy. Fred White was deservedly popular, an unselfish man of high ideals and wide interests, a truly great leader of science in Australia. At the age of 83, White could be a staunch defender of the scientific ethos that had motivated CSIRO for so long. In two radio talks about CSIRO, CB Schedvin, then Professor of Economic History at the University of Melbourne, argued that, in CSIRO’s decision-making, the scientific ethic must be supplemented by other values and criteria, especially economic ones. White disagreed and, with some of his former colleagues, had a brisk round of private correspondence with Schedvin on the issue. Fred’s care for people is illustrated by two of his activities. When studying birds, he sometimes took blind people to hear the songs. He obtained bird specimens so that they could feel the size, shape and texture of the bird they were hearing. Another of his recreations was carpentry, which he applied with considerable skill to produce furniture for the Whites’ home in Canberra and also to make wooden toys for disabled children. He died on 17 August 1994 at the age of 89. In addition he was a member of the National Standards Commission, chaired the Radio Research Board following Sir John Madsen’s retirement, and was Chairman of the committees on Antarctic research set up by the Australian Academy of Science and the Department of Science.